“All I want to do is drink good beer and eat some great food!” With that thought process, Garrett Jones left Ada, Ohio, and ONU and headed off to the New England Culinary Institute in Burlington, VT. After graduation, he spent time in Chicago honing his skills before heading back to his Northwest Ohio roots. While working at various local eateries, he was developing a game plan for his own place when his brother Griffin, who was a student at BGSU, told him of a location that he thought would be great for his concept. Garrett agreed and Reverend’s was born! Griffin, a marketing major, helped his brother out while finishing his degree and upon graduation decided to make it a career. Together, the brothers have developed a comfortable, relaxing place for sharing food, drink, and fun with old and new friends. As well as a large BGSU following, our customer base is diverse, from bankers to bikers. All agree, the beer is cold, the cocktails are the best around and the food is simply amazing! Reverend’s has perfected the art of “Bar Food”. Try one of our comfort food selections, or something from the southwest section of the menu. For a truly religious experience, try one of our huge burgers or sandwiches with some garlic fries and you’ll definitely agree with the “Heavenly” assessment. In keeping with the desire to drink good beer, Reverend’s is dedicated to serving the best microbrews and specialty beers in the area. Along with a large selection of bottled domestic and imports, there are also 12 rotating taps of seasonal selections as well as old stand bys. One thing that never changes is our love of beer. The Reverend knows beer! 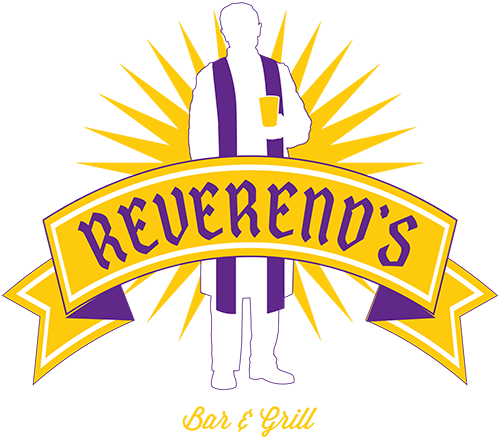 Reverend’s also has an assortment of unique cocktails prepared from scratch with fresh ingredients. Enjoy one of our freshly muddled margaritas, house-made sangria, or maybe let a blueberry mojito tantalize you!